The Dominican people have a long history with their machetes, using the tool to work the countryside and also to defend themselves. The machete is in the Dominican Republic the weapon of the everyman, and the former dictator of the Caribbean country, who was instrumental in the development of jazz merengue, even had songs urging his citizens to "grab their machetes and head to the jungle to defend the government of their Illustrious General." In the half century since the Dominican Republic began the process of suppressing propaganda to the former regime, little has been done to kill the cult of the machete, a weapon used to carry out a massacre of Haitians near the border by the US-backed despot, who saw his rise after being trained by US Marines. Although gun crime is rampant in Santo Domingo today, the government's plans to disarm the population has only seen the cult of the machete return with a vengeance. A recent report by ZDigital revealed that at the Salvador Gautier Hospital, 9 out of 10 people seeking surgical scar removal had suffered those wounds as a result of blows from bladed weapons. In just one hospital alone, up to 3,000 people a year seek surgery for scars inflicted at the hands of muggers, jealous lovers, drunken rivals, and every other creature which the tropical island has birthed. 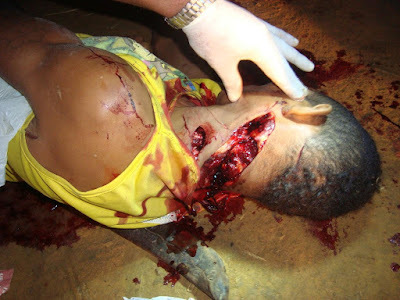 Some sociologists have taken to arguing that the level of machete crimes which the Dominican Republic sees per year means that doctors in the small nation treat as many extreme wounds as are typically expected in a low-intensity war, with more Dominicans being sliced or stabbed in a given year this century than were shot or bombed during the US invasion of 1965. The situation is so extreme that there are as many people missing limbs in the Dominican Republic as can be seen in some countries where despotic regimes planted landmines. Although people are being brutally hacked to pieces on the streets by machete-wielding psychos, the government has embarked on a campaign to take away guns from legal gun owners, while anyone can just purchase a large bladed weapon.